Adding decking to any garden adds a fresh new look helping it to appear more tidy and modern than before. It can be also be added to both new and older homes as a way to extend the garden or to provide an all weather proof area. In the summer months you will most probably enjoy your decking the most, basking in the sunshine and enjoying the warm wood underneath your feet. Decking is also perfect for special occasions like birthday’s and parties when you need a bit more room as extra people are round to join the celebrations. Decking provides an area that can give this alongside preventing shoes becoming ruined from muddy grass which can take months to recover from being repeatedly walked over. So what happens when you have a wonderful day in the sunshine and the evening starts to draw in? 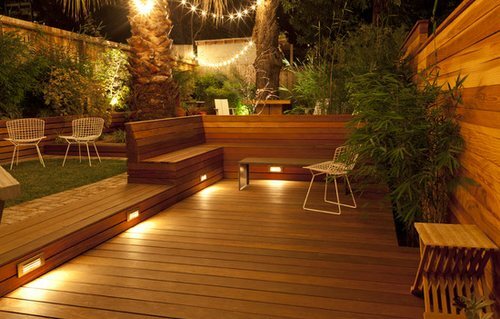 This is the time when you need some outdoor lighting to keep your decking looking great. Decking lights are both attractive and functional. They can provide light to areas throughout the decking as well as to areas that require some bright light like stairs or lower levels. 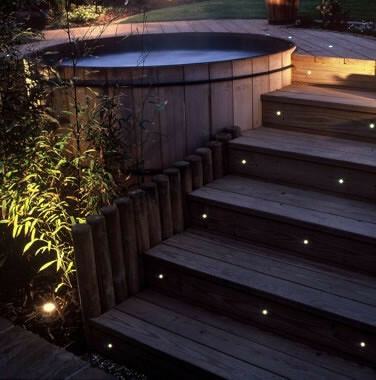 LED lights are perfect for providing this type of lighting allowing you to add different colours and atmosphere to your decking or patio area. They are also very good at using very little energy when compared to more traditional types of lighting. This is particularly important when numerous lights are required in various locations throughout a patio area saving you both energy and costs. LED outdoor lights are also perfect for those who like to be aesthetically pleased by their lights. There are many ways that the lights can be added to your patio or decking area depending on the effect you are looking to create. 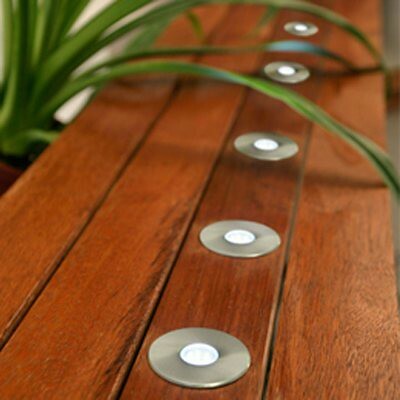 Add an extra edge to your decking with some sophisticated lights. The first is the surface mounted type which can be added to surrounding walls or to the top of areas of the decking creating a high bright light to the complete patio area. 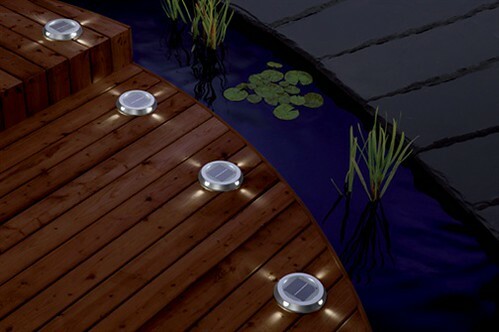 The second takes an opposite approach and gives the user an opportunity to place the LED lights in the decking. This can create a smooth and minimalistic look and prevents the chance from them being accidentally knocked down by animals or children. It is also possible to add frames to the LED lights so that they appear square or circle or to change the colour of the bulb for even more added panache. The outdoor decking lights are quick and easy to install by a qualified electrician adding a charming and ambience to any patio or decking area. Simple Lighting specialises in LED lights, outdoor lights and under cabinet lights.